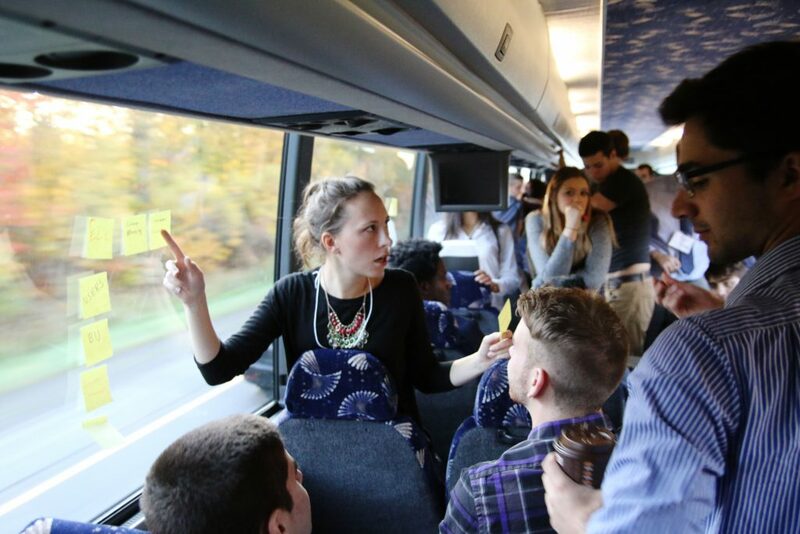 Leaving campus on a bus early Tuesday morning, students from multiple disciplines across Binghamton University spent the full day in New York City, meeting with alumni, entrepreneurs and innovators. The day included personal talks from various people who have used startups and digital skills to succeed in the world, as well as a visit to Uncubed, a digital skills and jobs conference, in which students got the chance to meet face-to-face with innovative, fast-growing companies. The trip concluded with a tour of Civic Hall, a hub for technology innovators, and an alumni reception. Kimberly Jaussi, an associate professor of organizational behavior and leadership at BU and the faculty master for Dickinson Community, led the trip. It was open to students from her Leadership 480A: Innovation and Creativity class, which can be taken by any student regardless of their major, and students in Entrepreneurship 480C: Intro to Entrepreneurship I class, taught by Aaron Cohn, ‘11. According to Jaussi, the trip was made possible by an anonymous alumni donor. She said the different day’s events allowed students to apply ideas learned in the classroom to the real world. “These kids not only do the work and the activities to learn the skills for creativity and innovation in this class, but then they can crosscheck what they learn, and find out it’s for real,” Jaussi said. On the way to New York City, alumni Becca Platsky, ’12, and Sung Kim, ’14, gave lessons on consulting and entrepreneurship. Platsky, who works at PricewaterhouseCoopers, provided an exercise for the students on the bus in which they participated in a mock consulting activity, while Kim, the founder and CEO of Chick-N-Bap, spoke about the process of starting a company on campus. Soundcloud and Vimeo were two of the over 60 companies represented at Uncubed, and following the talks students had the opportunity to interact with the companies at a job fair. Melissa Liebling-Goldberg, the vice president of editorial for mobile shopping company Spring, spoke at Uncubed about the importance of pursuing innovative ideas rather than trying to mimic recognized companies. MakerBot is a leader in the 3D printing industry, and its CEO, Jonathan Jaglom, talked about how the company’s goal is to let people express their creativity. For students like Kyle Alexander, a senior majoring in business administration, the talks provided an example of how to be successful in the entrepreneurial world. During lunch, Taryn Miller-Stevens spoke about her work engaging the LGBTQ community across the United States. She said that her work has been a learning experience that applies not only to what she does, but to innovation generally. “The most inspirational point of the last five years was understanding that what I really fundamentally believed in and brought to the people that cared about it the most, that they ultimately believed in it too,” Miller-Stevens said. At Civic Hall, Romke de Haan, the head of business development for 18F, a civic consultancy team for the government, spoke about his career journey. After a rough childhood and being affiliated with gangs in Milwaukee, he got an opportunity to learn information technology and coding through a program called Home Boys. De Haan attributed much of his success to the mentality that if you want to succeed at something, you just have to do it. According to Jaussi, the different events that were covered throughout the day provided an opportunity for students to learn in a non-traditional way, allowing them to not only see real-world applications of what they are learning about, but to see personal stories of success. “The fact that we are able to think about startup and innovation within traditional companies, within government agencies, within family businesses, within social movements — it’s just really an incredibly rich and, I think, very innovative way to deliver education to our students,” Jaussi said. For continued coverage of events from the day, including a talk by Andy Appelbaum, class of ‘88 and the founder of Seamless, check bupipedream.com and Tuesday’s print issue.